Rich Meier's Landscaping, Inc. - Providing 20 years of Quality Landscaping & Maintenance Service in Southern California! Welcome to Rich Meier's Landscaping, Inc. Serving L.A. County and its surrounding areas since 1991! Here at Rich Meier's Landscaping, Inc. we take pride in our work and exert pristine excellence in our services for customer satisfaction. We are a full-service family-owned landscaping company based in the Antelope Valley. 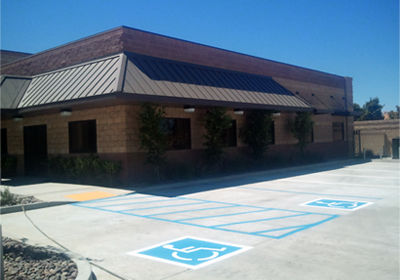 Our scope of work consists of commercial and residential landscaping as well as commercial maintenance. In years past and present we have served our community by bidding and obtaining contracts to both the City of Palmdale and the City of Lancaster. Some of our work may also be seen at Edwards Air Force Base and national parks such as Alta Dena, Castaic Lake and Veteran's Park; contracted through Los Angeles County Parks and Recreation. Military and public works contracting has relied on Rich Meier’s Landscaping, Inc. ability to competitively bid and execute a project that exceeds minimum standards. Same day service for all repairs & warranty calls!!! Our installation practices and use of high quality materials results in a high volume of installations with little to no warranty concerns. Our reputation for excellent work and fair prices precede us! We will continue to push forward in our goal to provide high-end designed, installed and maintained landscapes above and beyond customer and industry standards. So gives us a call for local Quality service for all your landscaping and maintenance needs!